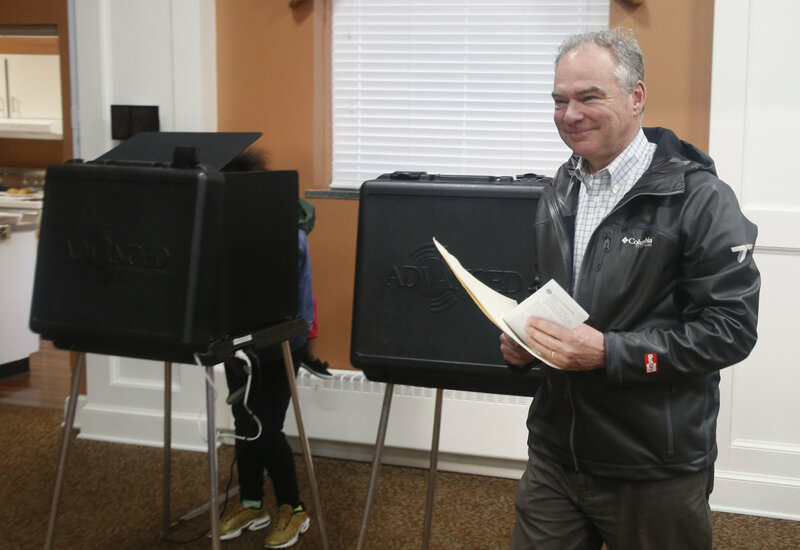 WASHINGTON — U.S. Sen. Tim Kaine, a Democrat from Virginia, retained his seat, winning re-election over Prince William County Board Chairman Corey Stewart on Tuesday. Kaine’s victory was powered by big results in the D.C. suburbs, including a 44 percent lead in Fairfax County, a 28 percent lead in Loudoun County and an 30 percent lead in Stewart’s own Prince William County. Kaine addressed his supporters at about 9:30 p.m.
Kaine referred to the often-acidic Stewart, who said when he announced his candidacy that he would run a “vicious” campaign. “We just want to make Virginia more welcoming, more inclusive … let’s just live like Virginia is for lovers rather than … for judgers or doubters or haters,” Kaine said. Kaine went on to cite two religious sources beginning with George Fox, one of the founders of the Quakers or Friends: “Walk cheerfully over the earth answering the divine spark in every person.” He also noted that Tuesday was the first day of the Hindu festival Diwali, which celebrates the victory of light over darkness and good over evil: “That’s not an accident – it’s right now,” he said. “We gave it a good fight and we have a great president of the United States,” Stewart said at his results party. AP VoteCast, a survey of 4,066 voters and 702 nonvoters in Virginia, found that white people with a college education preferred Kaine, and white people without a college degree modestly supported Stewart. Kaine was preferred among black voters and led among Hispanic voters. Voters under 45 were more likely to favor Kaine; those ages 45 and older modestly supported Kaine. Stewart built his campaign this year for Senate similarly to last year’s unsuccessful bid for governor: around support for President Donald Trump, attacks on immigration policies and, in some cases, Confederate symbols. WTOP’s Max Smith and Mitchell Miller, and The Associated Press, contributed to this report.